Take a venturesome electric car developer like Venturi, a Monaco-based firm, and put them together with an enthusiastic group of Ohio State University engineering students. Exciting things happen. The Buckeyes have tried their hands at racing in many venues. Their first outing in the 2013 Isle of Man Tourist Trophy Zero gained them a third place finish – followed by another third place outing in 2014, and their tour of the Pikes Peak International Hill Climb this year took a mere 11 minutes and 16 seconds, good enough for third place. They also race in the Formula SAE competition, putting their open-wheel, high-performance cars up against those from 110 other colleges and universities. Turning their eyes from the curves of the Isle of Man and Pikes Peak, to possibly the flattest place in America, the Buckeyes came in first this time, setting a world record 341 mph with their Venturi VBB-3, all 3,000 horsepower engaged. In fact, the team set two land speed records at the Bonneville salt flats in Utah – the two-way average speed required for a record, and a one-way run of 358 mph. 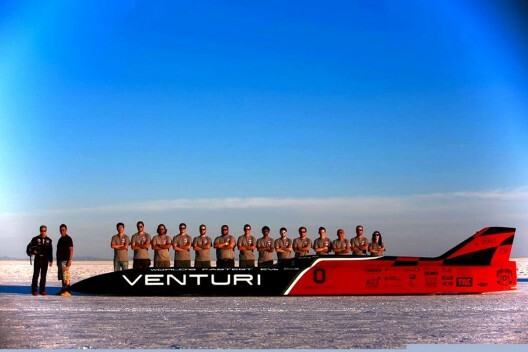 As the team reports, “After three years of battling difficult weather conditions at the Wendover, Utah, Bonneville Salt Flats track, The Ohio State University’s Venturi Buckeye Bullet 3 student team and driver Roger Schroer rallied to push their electric streamline vehicle to a world record two-way average top speed of 341.4 miles per hour (549.4 kilometers per hour) on Monday, Sept. 19, 2016. 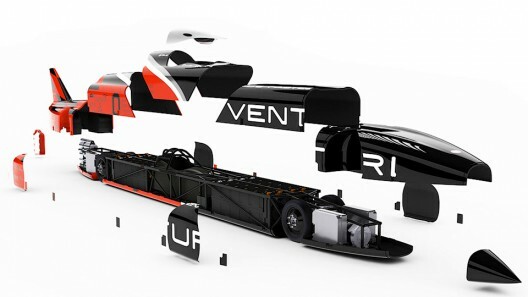 Venturi delves into many aspects of exotic concept cars, and even formula e competition. Despite the royal imprimatur, the Buckeye’s industry partner describes itself in a relatively modest way, considering the records it has helped set. “Venturi is an electric powertrain manufacturer headquartered in Monaco. It set its first world land speed record in 2009 with a fuel cell powered car that recorded a speed of 487 miles per hour. After that, the company switched its efforts to battery power and enlisted the aid of Ohio State. In 2010, its first battery racer — VBB 2.5 — was driven by Roger Schroer t0 a top speed of 495 miles per hour. S’chroer was back behind the wheel for this year’s record setting attempt. Combining the talents of a multidiscipline team of university students and an environmentally-conscious automotive firm has helped achieve sterling results this year. We eagerly anticipate where these trend-setters in aerodynamics, electronics, and mechanical applications go next. Who knows, maybe they’ll race at Monte Carlo next year.